Associated Bank colleagues participated in this year’s Juvenile Diabetes Research Foundation (JDRF) 3.1 mile walk/run event at Miller Park in Milwaukee to fight against type 1 diabetes. Type 1 diabetes (T1D) is a disease that impacts the lives of more than 29 million Americans. Representing Associated Bank at the event this year was team “Kids Matter at Associated Bank.” The group consisted of volunteers from various departments and branches throughout the Milwaukee region. The team raised $8,025 for type 1 diabetes research. And since its first walk in 2012, the team has raised almost $24,000. With the help of friends, family and colleagues, Flaherty has been able to face this challenge head-on. He started working for Associated Bank in 2011, and since then has completed the walk each year with his three kids, Keara, Danny and Caoilinn, and grandson, Owen. JDRF is a leading global organization focused on T1D research. Driven by passionate volunteers connected to children, adolescents and adults with this disease, JDRF is now the largest charitable supporter of T1D research. Its goal is to improve the lives of the affected by accelerating prevention of, as well as treatment and cures for, T1D. JDRF collaborates with a wide variety of partners and volunteers who share this goal. 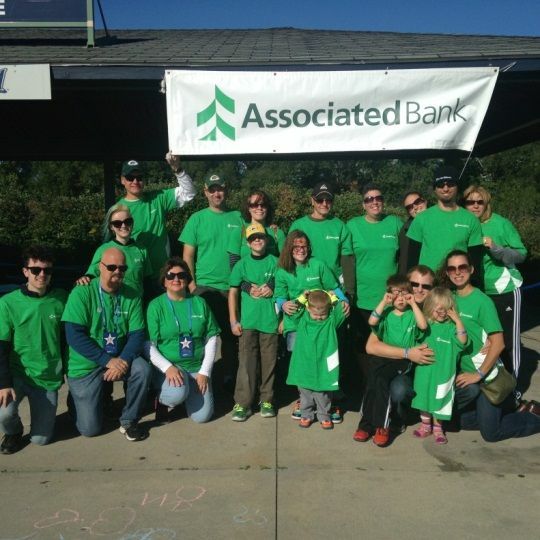 Photo caption: Team “Kids Matter at Associated Bank” proudly displayed an Associated bank banner at the JDRF event at Miller Park.